My family and I recently went on the bi-annual roadtrip from Houston to Indiana. My wife already has a Garmin that I purchased for her last year, but this was the first roadtrip with it, so there were no waypoints saved on it. I know, I know. Just copy the waypoints. The IT Staff in my home (namely myself) didn’t get around to it with all the packing and preparing. I packed my Garmin. About 9 hours into the trip, after fumbling through the GPS menus, searching, locating gas stations, tracking the next city, etc. and then having to bounce back to the final destination, I was getting frustrated. Two monitors are better than one on a computer, so why not two GPS? 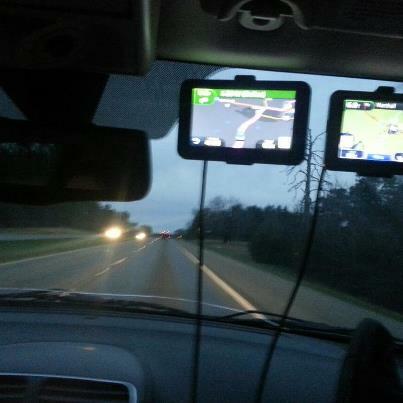 I grabbed the other GPS from my roadtrip bag and mounted it to the windshield next to my wife’s. After getting over being called a negative metaphore for an intelligent person, it worked out great, the frustration went away. One was constantly fixed on our final destination, while I used the other for plotting waypoints. I know some people might think “That’s too much of a distraction while driving!”, but it actually allowed me to focus rather than continually checking on the final destination. I was able to leave the list of nearby restaurants up and make sure I didn’t miss them. This also worked well with the nearby cities list so I could tell where we were driving. There has to be something to this, whether there is still room to improve GPS software, or two is always better than one. It just seemed more natural to me.